Varamo is such an interesting little work! It’s only 95 pages long (one of the series of Giramondo Shorts) so I packed it in my suitcase to read on the plane to Moscow, but I found that it took longer to read than I’d expected because I lingered over it. Cesar Aira is a rising star in Latin American literature, heir perhaps to the late Roberto Bolano in that he writes about bizarre, unpredictable events that have a kind of crazy logic to them. But Bolano writes very long books: I’ve only read The Savage Detectives so far but 2666 is waiting at home for me, taking up an inordinate amount of shelf room on the TBR. 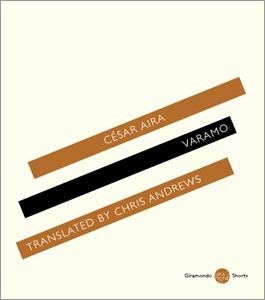 Aira’s Varamo is barely a novella by comparison, but it’s playfully inventive and deliciously humorous. I enjoyed it very much. Varamo is an apparently ordinary public servant who lives in the city of Colon in Colombia in Central America. Still unmarried in middle-age, he lives with his mother who acquired him as a foundling. This suited her just fine because (sans husband) she had always wanted a child, so she just kept him. Now suffering from dementia, she still exerts power over Varamo (which momentarily put me in mind of the ABC TV series Mother and Son) and he’s a bit anxious about confessing to her that when he picked up his salary it turned out to be in counterfeit notes. He knew they were counterfeit as soon as he saw them, but failed to react and so as the story begins he has two problems, how to get rid of them, and how to survive for a fortnight without any money. It would spoil the fun of reading if I were to reveal much of the plot so I’ll confine myself to what’s already there in the blurb. Varamo’s rather grotesque hobby is embalming small animals so that he can transform them into (in his opinion) witty artefacts for sale. He has mildly obsessive tendencies so he records every step of the process so that (if it works, which it never has so far) it can be replicated. His other habit is to go the club in the evening at exactly the same time every night, a habit which turns out to have great significance in the tale. Along the way Aria includes social commentary on the political and social inequities of the state, and he also comments wryly on the form and content of his own writing. Very PoMo! He links the advent of the Panama Canal with new developments in Colombian literature, and plays with conspiracy theories, investment rackets and the strangest public raffle in creation. All this in 95 pages! Translated by Australian Chris Andrews who has captured the wry sensibility of this work perfectly. Availability: You can’t buy this edition from FIshpond, only direct from Giramondo (who also have a special offer on for their Shorts series (five books for the price of four) at the moment. There is another edition available at Fishpond (see Varamo) but it has a different translator and I can’t vouch for whether it’s any good or not. I would prefer my Aussie readers to buy the Australian edition to encourage Giramondo to publish more of this terrific series (of which I’ve read and enjoyed three). Thanks for the link to this, Lisa. This does sound fun and full of ideas. I have another two Aira novellas in my set (The Literary Conference and An Episode in the Life of a Landscape Painter), but I rather wish it included Varamo! I look forward to your reviews of those when you get to them… do you like to read a run of the same author, or leave a gap before coming back some time later? I tend to prefer to leave a gap to put some space between books by the same author. It’ll probably be next year by the time I get to another Aira! Yes, I do that too, especially when the author is dead and I know there won’t be any more: I like to ‘save them up’ and space them out.